Halloween Hauntings Brought to You by the Most Recent Changes to Google and Yahoo! Halloween is right around the corner and Google and Yahoo are getting in the spirit. In the October 2014 Content Round Up, we’re serving up tips and tricks to keep the horrors at bay, and help you avoid getting tangled up in the web of, well—the World Wide Web! Yahoo was Google before Google was cool. Yahoo’s Directory was unrivaled. It gave (for the time) highly relevant search results; Yahoo was the industry leader. But its success wasn’t to last. Over the years Google has incrementally tightened its grip on Yahoo’s throat until at last Yahoo succumbed, effectively tapping out of the search engine game. What this means for you. This should only affect your business if you have ads on the Yahoo Directory. If so, Yahoo promises that you will be upgraded to a new service. In a more general sense, it means that Google has succeeded in burying another competitor and that the search engine juggernaut isn’t going to stall anytime soon. Clear evidence of this is the next three topics, all of which deal with Google. Back in June Google, without much fanfare, dropped authorship photos from search results. So it doesn’t come as a shock that Google has now completely killed its authorship markup project. Less than 24 hours after the announcement, authorship bylines had vanished from all search engine results pages. What this means for you. If you’ve seen a measurable drop in organic traffic from Google between August and September, the authorship changes could be to blame. We’ve noticed this trend in the clients who had embraced author tags and had thereby been enjoying the benefits of rich snippets. Without the more graphic, bold results, organic traffic for those on the authorship bandwagon was bound to flounder a little. But don’t despair. If your organic traffic has flagged lately, it should rebound once everyone is on an even, authorship-free playing field. Structured Snippets: A Snip or a Stab at Your Ranking? 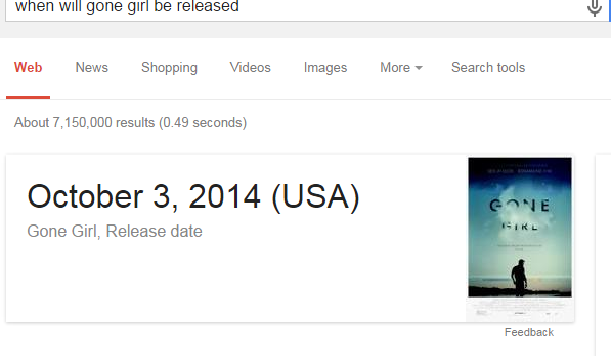 I searched for “when will gone girl be released” and this snippet appeared at the top of the page. Below were the “normal” search results you would expect. What this means for you. While we don’t see this becoming major issue for the average small business owner, it’s possible that the addition of the snippets could cause a decrease in the click-through rate for other search results on the page—yes, even the site that Google pulled the snippet from. For more on this, be sure to read this article, where five top SEOs weigh in on the subject. Google Panda 4.1 started rolling out last week. This update to Panda—which is designed to bar thin or poor content from ranking well—is the search engine’s 27th Panda update. It‘s essentially a bug fix for Panda 4.0. But that’s not all! A refresh of Google’s Penguin update has arrived as well. As with other Penguin updates, this one takes aim at shady backlink profiles and practices. Panda: Since this is more of a fix than a change to the Panda algorithm, it should allow more high-quality small- and medium-sized sites to rank better. So for our clients, and all small business, this should be a good thing. But as with all updates, only time will tell! Also, if you were mauled by Panda in the last update you may see your ranking improve, assuming you make the right changes to your site. Penguin: This update could affect sites with less-than-ideal backlink profiles, just as it did the first time around. Here at FWM we’ve worked diligently to fix any existing backlink issues for clients, so we are hopeful that our clients won’t be affected. Silver lining: The good news is that the new version of Penguin will be reviewed and updated more regularly going forward. So if a client is affected, it should take less time to recover than it has in the past. What's Scarier Than Search Engines? Killer Content! Readers Are Dying Off: Are You Writing With Enough Skill to Keep Them Alive? There is a phenomenon occurring that I’m not sure you’re aware of: the slow and terrible decline and death of readers. 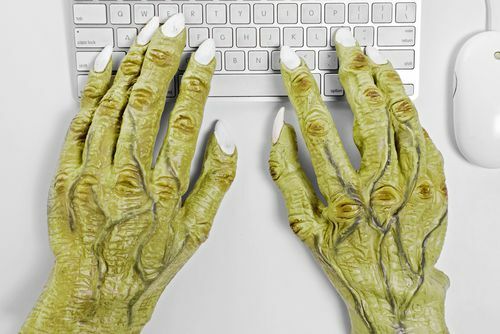 Modern man’s desire for a quick bite of content have driven most content writers to shorten their work and to speak to the eighth-grade level that over half of Americans read at. Our very own cranky grammarian, John Prager, recently highlighted the decay of readership, and gave advice for anyone attempting to create content for today’s audience. If you want to grab the attention of your audience, his article is must-read. What this means for you. John believes—and I agree with him—that while you should take into account the reading level and attention span of your audience, there is no need to dumb down your content. As long as your content is broken up by images and bullet points and you don’t wax poetic in paragraph-long sentences, it is possible to attract and keep readers engaged. So keep your writing crisp and interesting; keep writing alive! Related Links Draw Readers Deeper Into Your Site...Until They Convert to Leads! Related links are generally found at the end of an article. Their purpose is to engage the reader, to tempt himinto traveling deeper into your website. At FWM our writers use a related links box in the content they write and we find that doing so increases engagement and time on site, both of which increases the likelihood of a conversion. Good stuff! What this means for you. If you haven’t been using related links, it’s time to start! Read this article on the seven best practices for using related links to help you make the most of every link you use. Also, only use highly related links that follow a logical train of thought. If the article was about the specifics of bunion surgery, the articles listed in the related link box should deal with…you guessed it, bunion surgery! While every page on your website is important, your homepage is its most viewed page. It’s the face not only of your site but of your business, so it’s crucial that every element on the page is on point. To help you make the most of your homepage, the experts over at SearchEngineLand have laid out exactly what a local SEO expert would check for on your homepage. What you do with the information—run the audit yourself or ask your webmaster to do it for you—is up to you. But we strongly recommend that you read the article and implement its advice; nobody wants a terrifyingly ineffective website! #1 Ensure that your homepage isn’t being redirected. #2 Evaluate your homepage title and meta description tags. #3 View your website on a mobile device. Are the Subject Lines of Your Emails Boring People to Death? Email open rates depend on a few things: the day of the week, the time of day, and the subject line. This article deals with how to craft an email subject line worthy of clicking open, a crucial first step to email campaign success! What this means for you. I truly believe that you can increase your open rates dramatically by avoiding long subject lines, thinking mobile, and adding a personal touch. But don’t think that you can rest on your laurels! If your email subject is awesome enough to warrant an open, the content in the email better make good on its promise. Fantastic content wins—always! Socktober has arrived! ‪Socktober is a Foster Web Marketing tradition. Several Octobers ago, the FWM team began splitting into teams and fiercely battling for points by wearing their coolest socks. The points didn't count for anything; it was just for fun! This year, however, each team is supporting a charity! The winners of Socktober 2014 will be able to make a monetary donation to the charity of their choice. And we want YOU to participate, too! How to help: Post your awesome sock pictures and tag Foster Web Marketing on Facebook. Don't forget to include your team of choice: ‪#‎teamnerds is supporting the Katherine K. Hanley House in Fairfax, VA, ‪#‎teamgeeks is supporting the Artemis House in Arlington, VA, and ‪#‎teamvideo is supporting the Embry Rucker Community Shelter in Reston, VA. Each sock picture you post with #Socktober will earn the team of your choice two points, so get to postin'! Worthy charities and rockin’ socks—what could be better?! If you’d like some help understanding what these changes could mean for your site, or if you’ve experienced a drop in traffic after these changes, let us know! We want to help usher you through every terrifying move the Internet throws at you. To get your questions answered, please leave your comments below. And for up-to-the-minute marketing news, like us on Facebook or follow us on Twitter.